What makes our Retirement Plan solution a better choice? First, we help businesses design a plan that can help address their business’ needs. A customized solution is just better. An example may include allowing higher contributions to the business owner or other highly compensated employees. Unfortunately, too many plans are just standardized solutions and not specific to the business’ needs and intentions. American Trust specializes in complex plan designs with you in mind. Let's maximize your benefits! Second, we help protect the business owner(s) and plan sponsor from a fiduciary standpoint. There are ongoing responsibilities to monitor the plan’s investments, and all too often business owners and plan trustees have a misconception that this is ‘being done’ for them. . The reality is that it is still the business owner or plan trustee who is on the hook for these responsibilities. 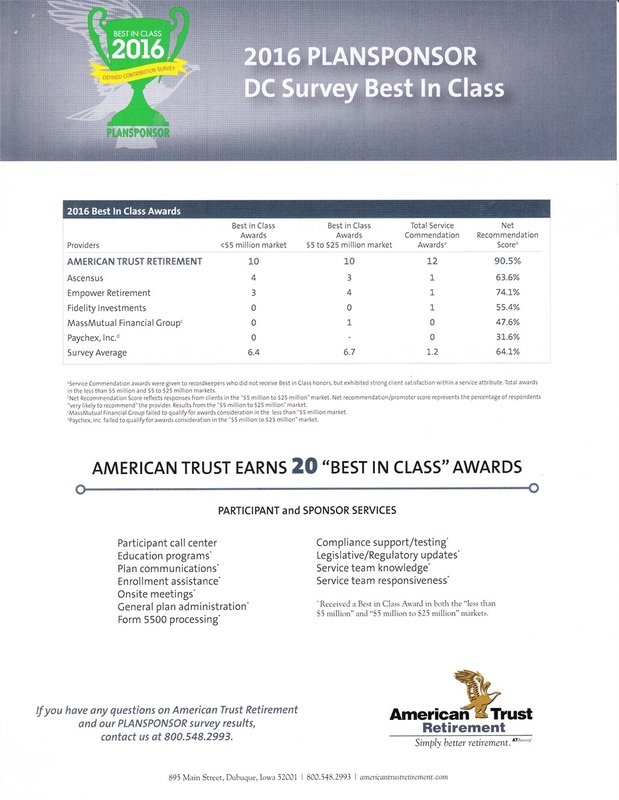 American Trust provides fiduciary oversight at the greatest level. Get the guidance and protection that you need. Simply better solutions at a simply better price. Find a cost-efficient solution suited to YOU! OR, you would like to have a FREE Analysis of your current plan . . . .